These turtle cupcakes have legs! Well, Junior Mint legs anyway. They’re fun for kids and adults alike. What You Need: 1 cupcake; frosting tinted green; 5 green M&Ms (any shade that contrasts with the frosting); 4 Junior Mints; 1 green Necco wafer; 2 candy eyes (or use writing icing or mini M&Ms); red writing icing. How to Make It: Frost cupcake. Add Junior Mint legs and M&M spots. 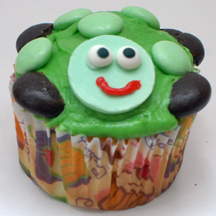 Add eyes and a piped mouth to the Necco wafer and place on cupcake to form turtle head. This entry was posted on Sunday, August 3rd, 2008 at 12:25 pm	and is filed under animal cupcakes. You can follow any responses to this entry through the RSS 2.0 feed. Responses are currently closed, but you can trackback from your own site.